Cassandra Chen was recently appointed the Pforzheimer project digitization specialist. Four years ago, she came to the University of Texas at Austin via Taiwan. Initially, Cassandra was a volunteer in the Ransom Center preservation lab. While in the University’s Information School, she joined the staff as a student employee in the digitization lab and was soon promoted to lab manager, a position she continues in while working part-time on digitization of books from the Carl H. Pforzheimer Library. The Carl H. Pforzheimer Library focuses on English literature and culture between 1475 and 1700. Highlights among its more than 1,100 printed books and 2,000 manuscripts include early editions by William Shakespeare, Francis Bacon, and John Milton, and documents by Elizabeth I and Sir Walter Raleigh. With the exception of the Shakespeare’s First Folio (1623) and an important group of manuscript newsletters, however, the rich materials in this collection have not been photographed and made available online to audiences beyond the Ransom Center’s reading room. The current Pforzheimer digitization project represents a modest step toward remedying that, with at least 50 early books of drama and poetry slated to go online this academic year. In the queue are rare editions by Shakespeare, Christopher Marlowe, Edmund Spenser, Sir Thomas Wyatt, and others. Before starting this new digitization project, I was able to ask her questions about her life inside and outside of the Ransom Center. I was born in Taiwan where I completed my college undergraduate degree in English literature. From there, I moved to London and earned my first Master’s degree, in literature from University College London. I then moved to the United States in 2014. I’m still an alien here! I’m not completely used to the whole environment and there are still some culture shocks from time to time. What attracted you to the Harry Ransom Center? One of my friends, Ya-Chu, who is also from Taiwan, had an internship in the Ransom Center’s preservation and conservation department with Olivia Primanis, Head of the Book Lab. I had been to the Ransom Center’s exhibitions many times, but through my friend I met the people who worked behind the scenes. I thought since I love museums, I could probably be a volunteer. I started as a volunteer in the preservation lab. Eventually, I went to the University of Texas School of Information to take classes related to museums and preservation. That’s how everything started, and in May 2017 I received my second Master’s degree in Information Studies with a portfolio in museum studies. I had an interest in this field, but through Olivia and all the great people in the preservation and conservation department, I went from working as a student employee to a permanent staff member. I have so many favorite parts. I get so excited when I see that the book I’ve digitized is now online in high resolution and high image quality. You can even see watermarks on papers, because the equipment we use is really good, so everything is sharp and clear. Looking at images and books online makes me feel satisfied. Another part I always enjoy is the opportunity to see the amazing collections at the Ransom Center. One day our photographer was shooting Einstein’s 1953 gravitational waves manuscript in his studio. I was telling everyone “they have Einstein’s manuscript!” I’ve also worked in the reading room for the past eight months, so I have seen a range of materials, including the “hair book” created by Leigh Hunt. It’s a book with a lot of famous authors and statemen’s hair in it. There are a lot of amazing things here. I really like Kazuo Ishiguro’s books; I’ve read quite a lot of them. There was one summer I spent digitizing some materials from his archive. It was one of my favorite assignments, since I had read his works and was able to see his process. For example, in one of Ishiguro’s notebooks, he constructed a reading list for himself to develop a novel. He also traveled around the UK to collect information for his novels and you can see his notes and lists, revealing how the novel was formed and the ideas behind the scenes. I’m kind of a homebody, and play World of Warcraft in my free time. Whoever meets me never thinks of me as a gamer, but I am. That’s one of my habits to decompress. I also love to read. My favorite is Japanese literature. Some authors I enjoy are Haruki Murakami, Shūichi Yoshida, Yōko Ogawa, Kuniko Mukōda, and Kaori Ekuni. I love Japanese culture. Because I lived in Taiwan and it’s so close to Japan, I was exposed to a lot of manga and animation growing up. I still watch animated shows. Do you prefer reading digital or physical books? Physical always. I still prefer to read in Chinese, my native language. I can read really fast in Chinese Mandarin, but when it comes to English, not so fast. Reading Chinese Mandarin is more of a reflex than English is. I brought about 100 books in Chinese with me from Taiwan. I traveled half the world here with my books, so I’m not throwing any of them away. I take them wherever I go. If I move then I move with all those books. Whenever I need to buy a new book, I have to buy it in Taiwan, because I can’t find Chinese Mandarin books here. When I visit Taiwan, I’ll bring a batch of books with me. If you’ve traveled, you know that it’s heavy and expensive, but I still do it. Even though I work in digitization, I always prefer physical books. 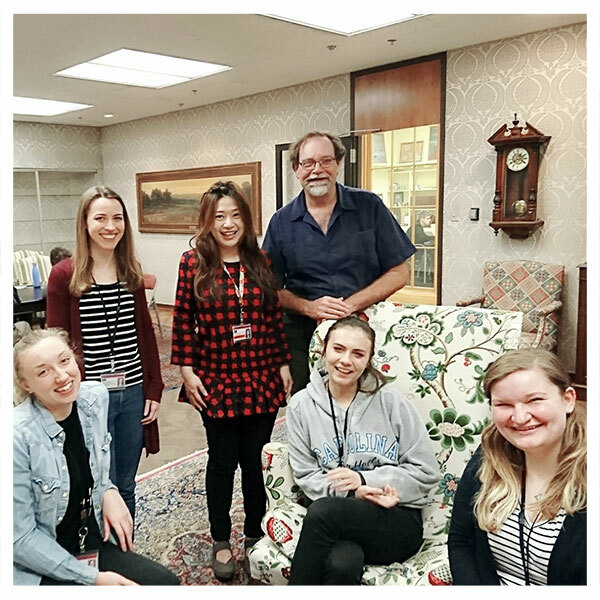 Photo: Cassandra Chen, center, with former Ransom Center photographer Pete Smith and student employees in Digital Collection Services.